We are proudly presenting you our first boat in Croatia under the logo and name of INVICTUS YACHT. What better way to combine stability and comfort, then with the design of world famous designer Christian Grande, whose sense of style and pure elegance has been recognized and awarded worldwide! The 190FX is for lovers of sea adventures. With a solid and robust hull, without giving up on comfort on board, you will feel more than comforable while cruising around. The hull has been projected with a sleek and streamlined shape, with a surprising sea worthiness and speed, even with rough seas. As every Invictus it benefits of all other main qualities making the Italian yard a new reference in the boating industry. Invictus 190 FX is a stylish, functional and fast boat, equipped with an fuel-efficent Yamaha 115 HP. 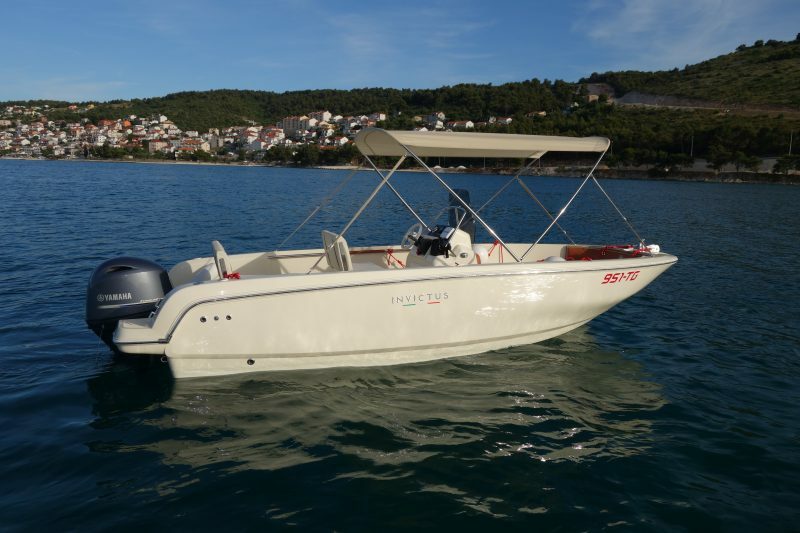 This boat is a perfect choice for family cruising, light fishing, water sports or simply soaking up the sun! You don’t have to pay deposit if you have skipper with you who’s payed 70EUR per day. This article was posted in Boat exursions, Excursions. Bookmark the permalink. Follow comments with the RSS feed for this post.Both comments and trackbacks are closed.